Oilers - Embarrassment or Rebuild? The Edmonton Oilers have had some of the most faithful and loyal fans over the years and if your buying what is being sold in Oil Country these past 5 years, you probably are getting the sense it just might be food poisoning. Rebuild is being preached, patience is being pushed and optimism is constantly being sold. Who stands accountable for the results the Oiler fans are witnessing? Name a franchise that offers more promise every year for improvement but continues to screw it up and somehow get worse? With what Edmonton has got in the draft these last 7 years for opportunities there is not another organization that has messed up this bad. The only constant has been firing a coach and bringing in another. Granted IMO some of the coaches did not do a good enough job and still continue to over promise and make bonehead coaching decisions. In the end, it is the players that are assembled to build a winning team. 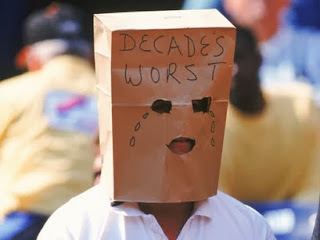 I am and will always be a Edmonton Oilers fan but this has become a total embarrassment of a team to watch. I watch games with excitement and anticipation to only feel like putting a brown paper bag over my head in shame that I still support and love my hockey team. 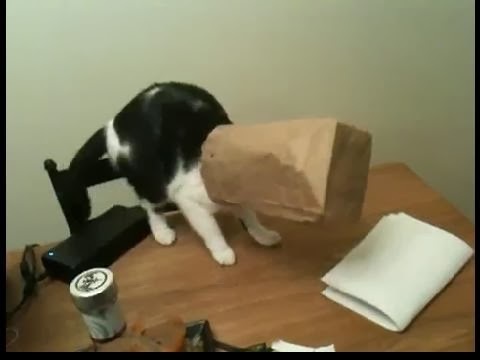 Heck, the team has gone to the dogs so bad, even the cats wear brown paper bags over their head. I have been offered by friends to go to a Oilers game here or there this year. I declined! Why? I know what to expect. 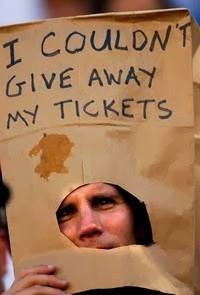 (Or should I say, I am all to familiar with wasting my hard earned money at Rexall on outrageous prices to watch a sub-par performance on the ice) Those same friends and several others I know or have heard from can not give away their tickets this year. Why is that? Disappointment lies in their future 80% of the time. I am impressed how Oilers staff can keep sugar coating hope for the future and patience in so many different flavours. Hats off to them, they do a great job. Granted I do not have the answers to this problem only ideas. On the other hand, I am not paid by the Oilers to solve their problem. Nope but I do PAY to watch this team and somebody has been stealing my money for years. I know this has come across as a 'doom and gloom' post. Truth is, this team IMO is only a few moves away from being a consistent playoff team. They have skill, they have good prospects still in the system but what they do not have is a 'winning culture' and it appears from ownership down that losing is acceptable for the time being. In the meantime, keep your stick on the ice! Goaltender Richard Bachman made his Oilers debut last night and looked calm and cool. Based on last night's game, I like him. A lot. He made saves that needed to be made and other than the shootout, he was really good. He read the plays well and his positioning was pretty much spot on. He might have just won himself the backup job. He was that impressive. How did he look to you? After yesterday's trade of Mike Brown for a 4th round pick, it makes sense to clear a roster spot. I'm ok with it. However, the Oilers just broke up the one consistent lines they've had. You knew what you were getting with Gazdic, Acton and Brown. You knew they were going to work hard at playing hard. I quite liked that line. I'm kind of sad it's been broken up. But, Ben Eager has been recalled and I'm assuming he fills Brown's spot on that line. Interested to see if he can fit in. I'm doubting it, but we will see. With Eberle and Smyth being questionable to play against the Habs, the Oilers have recalled forward Tyler Pitlick. Pitlick has never played an NHL game before. This will be good experience for him and well deserved after a really good training camp. Congrats Tyler! Here I am again, 2 entire weeks later completing the next part of a simple 2 part blog. Is that not crazy? Maybe, maybe not! Life comes along, sometimes you face a curveball, sometimes the puck bounces in a funny way and other times you pleasantly get through a game just happy to have survived yet another day. I will tell you what is crazy...it is the team we all love here at OilersJambalaya, called the Edmonton Oilers. This year's version of the Oilers should be a better team by a long mile. Some trends are presenting themselves and some players are still adapting. I was asked why I believe anticipation is rising in Edmonton and area when this team plays so 'blah'! Having been watching this team for years very closely missing no games and following all the critics local and abroad, I have made some observations. Some things the Oilers do (both on ice and off ice deserve to be criticized but some things are just hockey fans of the oilers and haters of the Oilers being harsh and unreal. Truth is, Oiler fans and Oiler haters, do anticipate something greater and bigger from this team with the talent and skill they have acquired and rightfully so. That extra anticipation brings with it expectations that are through the roof and either enrages fans or it makes them impatient or overly eager for instant change and a winning record and culture. Anticipation is rising, like it or not and the Oilers need to come through or their will be drastic changes to some elite talent being shipped out. Yeah sure I get the arguments both ways but people outside the Oiler franchise in general have no idea what is sitting here, maybe that is why Oiler fans are so badly wanting to stick it to other NHL team fans for their stupid comments they constantly hear or read. Yakupov not worth James Reimer? What world are they coming from? C'mon let's not be stupid. Yakupov is a cancer in the dressing room and has a attitude? Oh what they really are saying is Nail has a personality that they can use quotes from and mis-communicate it due to language , culture and personality. Sometimes I think media are just looking to stir the pot. On the other hand, Oiler fans seem to come across as they have the greatest superstar in the world in their hands and over estimate the players abilities regularly around this team. I am just using Yakupov as our latest example but insert said player and the results are the same. It does become a emotional roller coaster after awhile. Sure their is the occasional one that makes sense but this in the day and age of social media become quite crazy. Here is some examples of crazy trade proposals...(Yakupov for Jake Gardiner and 2nd rd pick) Are they serious? That is a fair offer? How about this one? (Hemsky plus Oilers 2nd rd pick and Martin marincin for Braydon Coburn and Brayden Schenn) Really? Here is another (Ryan Jones and Martin Marincin for Braydon Coburn). My recent favourite trade proposal was (Yakupov for Gorges, Gallagher and Montreal 2nd rd). The list goes on. Oiler fans think they can trade low quaility or expiring contracts or under performing players for highly competitive or high skilled big power forwards, it just is not happening. MacT made a decision on Perron and people ripped him, do those same people feel the same today? I think we see Paajarvi resurface but not as a established NHL'er in St.Louis. He gets traded to a team needing more of what he offers down the stretch. I am not speaking of the rebuild, I am speaking of just fans not being patient. DD was going to pull out of it, just like MAF was in Pittsburgh. Goalies need to develop chemistry with their team and with a different defensive structure playing in front of them, things change. It takes d-men who want to bail out their goalies to see a Goalie play better, it is 80% about confidence and momentum (mental part of the game) and this year Goalies are adjusting to the pad size. Yes believe me, as a Goalie changing size of pads is a big deal and can take as many as 10 games to make the adjustments. This is our new team this year...new players, another new system that is very confusing for the players (including the goalie when his d-men are not in their regular spots to take away the high quality shots) and as mentioned in a earlier post I did, it will take til about the 15 game mark to really figure out what the Oilers will really look like this year. From the 15 game mark, I will rate the players accordingly. They are pro's and will figure it out and be in top form and have had enough time to develop the right chemistry and fit. Looking through this team, there really is no built in excuses why this team can not be a playoff bound team this year. Let's look at some more reasons we can anticipate the excitement building for the Edmonton Oilers. Perron is a tough SOB for his size, a agitator and has top end skill. He is a keeper that the Oilers are fortunate enough to have picked up. His versatility, talent, speed and hockey sense around the net should pay off especially if this team can make it to the playoffs this year or next. Going through a tough change IMO it's more about learning the new system. His chance taking opportunities do not seem covered by his d-partners this year and that costs him in the offensive department. He will need to make a little less risk pinches but when he develops the right chemistry with his d partner, Schultz will be a dynamic offensive player. What can be said about Eberle other then amazing? His hockey IQ is incredible and his shot is amazingly accurate. Not many players like him in the league and hopefully he can stay healthy all year without injury and rebound to his previous season of play. My apologies to our blog readers here at Oilers Jambalaya over the last while. I have been in somewhat of a hiatus for awhile. My daughter recently got married outdoors and the extra work and effort between that and my regular paying job kept me quite busy. I did manage to stay focused on spreading the Oilers Spirit though. I must say, when I was asked to come on and join Smokin Ray here at Oilersjambalaya a couple years ago, I was full of excitement and anticipation. The Oilers had been trying to scratch and crawl their way back to respectability and were drafting and developing new talents much better then in years past. My excitement for the team , the prospects and their development was hard to surpass. I would spend endless hours in research and conversation with any contacts I could find that had any information that could be useful or give myself a different look at these players. As the last few years have passed by, that same excitement started to dwindle and while I am still a die hard fan, it has been less emotional excitement then in the past. Why? I am guessing maybe emotional drain? Maybe it is disappointment? Frustration? Regardless of what it was, I was still faithful and still am today watching and following this team. Some have said not drafting the best young player in the world for the 4th consecutive year in a row did it to me. Maybe, but bringing in a new coach and everything MacT has done has not impressed me yet. Sure it's a start but the proof as they say, is in the pudding! This year, it's time to 'put up, or shut up'! Anything less the a playoff push to the last week is a train wreck to me. I know, teams can only improve so much without major change in player personal. That is true, but no one who drafts as high as the Edmonton Oilers and has elite talent like they do, should grow slowly like some teams that finish in the middle of the pack and yet still see drastic improvement with little changes. With the natural physical, mental and emotional maturity of elite talent comes great strides. Enough about the past! I love that Eakins cleaned out the past player persona in the changing room. The past is not what you build on, its the future you build into. Having said that, I am starting to feel that 'twitch' again that makes me jump, scream, shout or say 'Yes'! on every Oiler goal, assist, save, hit, fight and plain old 'sweet play'. Looking through this team, there really is no built in excuses why this team can not be a playoff bound team this year. Let's look at the reasons we can anticipate the excitement building for the Edmonton Oilers. He's back!! Do not look at his stats line from last year when he was fighting a injury that limited his shot and passing. I have followed RNH for the past 5 years and last year, his whole offensive game was affected. What did he do? Became a even better center defensively. Once RNH can bring his FO% up to around 50% he will become a Top 5 Center in this league as far as I am concerned. His presence on this team will be a huge boost and the team's offensive output will start shooting through the roof of arena's everywhere. Why? Because it will be contagious and will be a catalyst this team needs. Gordon is a player who can win face-offs, fill in a night or two on a higher line, back check, and just plays the game the way any hard nosed player should. His dependability and reliability is something this team will greatly appreciate this year. Also Boyd will seldom makes stupid plays that leave you shaking your head. In training camp and pre-season and right throughout the 1st period in the season opener, you can see Nail has gained some great strength in protecting the puck. He doesn't just dangle it, he dares the opposition to take it away from him. He handles it like a bull in a china shop and he doesn't care about the results other then getting that puck to the net. His one-timers from anywhere are hard, crisp, fast and bulls eye accurate. His one-timers take a backseat to no more then maybe 10 current NHL'ers currently playing and if he continues to grow in this area, the sky is the limit for this Russian kid. His hunger for the game, his relentless back check and speed will not be able to be contained too often as this season progresses. Not many players can play like Taylor Hall plays. His intensity, versatility, drive, speed and love for hockey make Taylor Hall one of a kind. The fact he has been able to make this shift to centre in the loss of the Oilers top 2 centers has been nothing short of incredible. Sure there have been some mistakes but playing a 1st line center role when you have never done it at a NHL level? That is crazy and he is still holding his own. With Nugent-Hopkins set to return , it is likely to free him up some to relax and take some of the pressure off of him. Don't forget he is carrying two players in Hemsky and Smyth who most Oiler fans wanted run out of town not long ago. Hall with a Yakupov and Joensuu could be a interesting line while Perron and Eberle play with Nugent-Hopkins? No matter how it plays out, left wing or centre , Taylor Hall is a stud out there and intends to make this a winning season at any expense. Don't fret Oiler fans over the opening night loss. I know it may look like the same old story but this team while down 2 of their top 6 players has looked dominating at times and with this new 'swarm' philosophy of hockey for the Oilers, it might just suit this team well. The addition of some new players added to the mix currently growing by leaps and bounds could be what takes this team back into the 'sacred temples of Lord's Stanley'. We all know the Oilers have named Andrew Ference as the 14th captain of the team. Today they announced that Ryan Smyth, Taylor Hall, Jordan Eberle, Ryan Nugent-Hopkins, Nick Schultz and Sam Gagner will be the assistant captains. It's That Time Again... GAME DAY!!! Tonight marks the first game for the Oilers for this new season. I can't wait! Game starts at 8pm and its on CBC. I'm excited to see this lineup. I'm expecting a big game from Hall, Eberle, Perron, J. Schultz and the new Captain Andrew Ference. This should be fun to watch. For the first time out of 82 times, GOILERS!! !